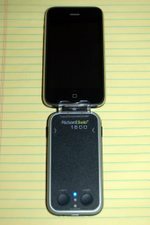 Review: RichardSolo iPhone batteries - iPhone J.D. GPS, 3G, push e-mail, bright screen -- no matter what smartphone you use, these are great features but they will eat up your battery if you use them a lot. Apple has improved the battery management of the iPhone substantially through software updates, but you can still easily use up your battery by the afternoon if you make heavy use of the iPhone all morning without plugging it in. Thus, it is helpful to have an external battery with you to get a recharge. 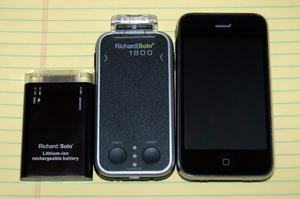 Richard|Solo -- a company started by Richard Thalheimer, the founder of the famous but now defunct The Sharper Image -- is one of the companies that provides an external battery for the iPhone. Several months ago, I purchased their $50 backup battery and I have been very happy with it. I recently received a review copy of a $70, larger version of the battery so I had a chance to compare the two. Both are excellent, and you will have to consider your needs and preferences to decide which is right for you. 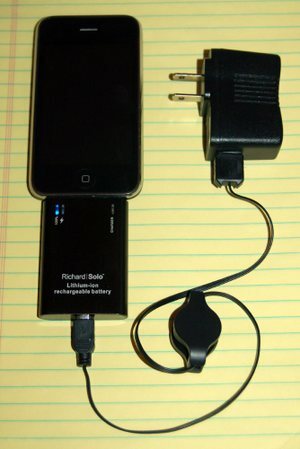 The $50 version is the original iPhone battery released by Richard|Solo and it is called the Richard|Solo Backup Battery. It is very small, about 3" by almost 2" and half an inch thick, and at under two ounces is very light. If you slip it in your pocket, you will hardly notice it is there. It is durable and scratch-proof with an aluminum case. It feels good in the hand and well constructed. If I let my iPhone 3G discharge until the point where I get the 10% battery life left warning and then plug in the external battery, it will bring me back to about an 80% charge before the battery runs out of power. It takes about an hour to charge the iPhone to that 80% point. You can use the iPhone with the battery attached. It is only a little awkward to have the battery hanging off the end while you do so, and I have done it many times. I find that charging to 80% is more than enough to get me through the rest of even a busy day of use. It even passes the ultimate test -- the CLE test. (That's "Continuing Legal Education" for those non-lawyers who read this site.) When you are sitting through a day-long CLE, you often find yourself spending a lot of time talking on your iPhone during breaks and using e-mail and the Internet during the presentation. And you never seem to have a good WiFi connection, so you have to rely on the power-hungry 3G radio for a fast connection. All of this puts a lot of demand on a battery, and by the early afternoon I often find my iPhone almost dead. Plugging in this battery gives me more than enough power to make it through the end of the day. 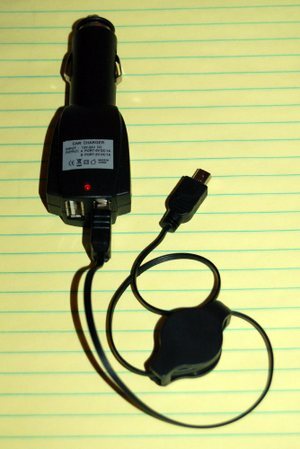 The battery comes with a power adapter that consists of a USB outlet plug plus a retractable cord with a USB connector on one side and a small mini-USB connector that plugs into the battery on the other side. A great feature is that you can charge both the iPhone and the battery at the same time. Just plug them all in and first the iPhone is fully charged, and then the battery is fully charged. 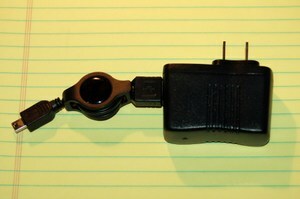 Because the cord is retractable, it packs up very small. 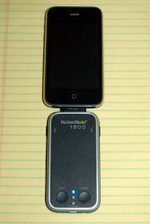 When I travel, I don't take the power cord that came with my iPhone; I just take this compact one along with my Richard|Solo battery. At night, I plug everything in, and by the morning I have a fully charged iPhone and a fully charged battery. The Richard|Solo 1800 Battery is the $70 version. The extra $20 gets you about 50% more battery life. In my tests, if I run my iPhone down to 10% power, then plug in the 1800, I can get a full 100% charge in about 90 minutes or so, plus I have enough power left in the 1800 to give me about another 25% of power. So if you want to more than double the length of time that you can go before plugging your iPhone into the wall, the 1800 really delivers. The 1800 is larger than the original battery, about 4" by 2", and the same half-inch thickness. It weighs just over two ounces, so just slightly more than the original battery. The difference in the numbers seems small, but the 1800 really feels bigger. You can drop the original battery in your pocket and you may forget it is there, but put the 1800 in your pocket and you will definitely notice it. It also doesn't feel quite as good in your hand; instead of the smooth and solid aluminum of the original model, the 1800 is made of plastic and as a result feels like a "cheaper" product. The 1800 latches when it connects to the iPhone, and you need to press two buttons on each side of the 1800 to release the connection. Also, the 1800 comes with an optional plastic support brace that holds a snug connection between the 1800 and your iPhone. You don't need to use it if your iPhone is just sitting on a table charging, but if you pick up your iPhone with the 1800 attached you will definitely want to use the brace to keep a snug connection. The latch and the brace act together to give you a much more sturdy connection to the iPhone than the original $50 battery. On the other hand, because the 1800 is so much longer, you feel the need for a sturdy connection much more with the 1800 than you do with the original battery. The 1800 comes with the same useful power adapter as the $50 version, but with the 1800 you also get a car cigarette lighter plug. It even has two USB ports so your car can charge the 1800 (and an iPhone) at the same time that you charge something else. I can see that being useful, although I haven't had a reason to try it yet. But after using both for several weeks, I find myself using the original model much more. The original model cannot charge the iPhone quite as much, but it charges it enough to get me through the rest of the day, which is all that I need. Plus, it is so small and unobtrusive that I can toss it in a pocket and barely notice it is there. With the 1800 in my pocket, it is certainly light but I can't help but notice it. If I use my iPhone with the smaller, original battery attached, it doesn't really get in the way. 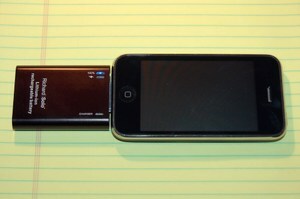 With the 1800 attached, you feel like your iPhone is twice as long and it really is much more awkward. So for these reasons, I recommend just spending the $50 for the original battery. On the other hand, John Gruber concludes his review of the 1800: "I’d strongly recommend this one over the original 1200 mAh Richard Solo model because of the higher capacity and the latching connector." So you just need to decide what is more important to you. Smaller size or more battery power? Better feel in the hand or lights and lasers? Whichever you choose, these batteries are good investments. I wouldn't think about going to court, a deposition, a plane ride or a CLE without carrying one with me.